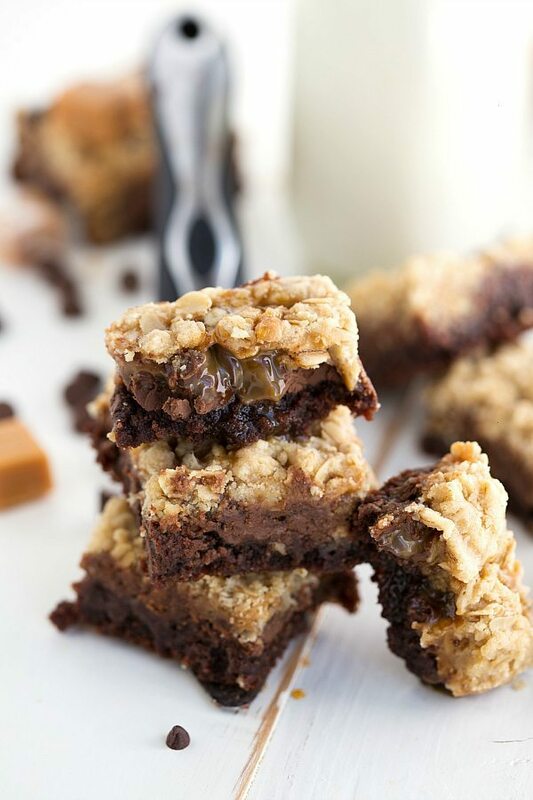 Delicious oatmeal cookie bars with a chocolate caramel brownie base – a “brookie” (brownie-cookie) bar at it’s best! Hey everyone! How was your weekend? And how is this dessert for starting your Monday off in a great kind of way?! Mondays definitely call for a bar just like this! 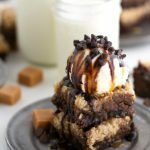 Brownies combined with cookies, plus caramel, and a chocolate layer? Yeah this is kind of a crazy dessert, but it’s absolutely delicious. And it’s honestly not “too rich” even though it kind of looks like it would be. I had the idea to make some kind of brookies (brownies and cookies mashed together) and thought bars would be the simplest way to make them. From there, I wanted to get a little more creative with the cookie topping and since these molten lava oatmeal caramel cookies are probably my favorite cookie ever, they were the inspiration for the caramel-chocolate-oatmeal cookie layers. Since I’ve been dying to share with you all the cake I made for my mom’s birthday over a month ago (chocolate with chocolate mousse layers), I decided today would be the perfect day to share that recipe! However, I had some bad luck this past week. The first time I made the cake, one of the cake layers broke in half as I was trying to layer it. I tried to salvage the cake, but it ended up being pretty slanted and didn’t look too spectacular. So, no big deal, I decided to make it again! The next time? Gorgeous cake — I was so excited to start taking pictures of it! And then I dropped it. The entire cake – on the floor. Somehow I thought I could carry my little guy AND the cake at the same time. When he lounged forward, the cake followed. Okay, so third time is the charm right?! Wrong. This time I thought I would change up the mousse a bit and try something new. Somehow I had become bored of making the same mousse. 🙂 So I tried something different and bam – mousse ruined. I slightly over-cooked those cakes too and that was when I threw in the towel for this cake. PLUS, I only had to attempt these bars twice before getting you this recipe so that was a major bonus. The first time they still tasted great, but I way under-cooked the brownies. It ended up more like a fudge at the bottom. And I decided the top cookie layer needed a little more “omph.” Second time and these bars are now considered perfection by the husband, the babe, and a few members of my family that got to sample them. I sent some with my mom to take to my great grandma and she loved them too! Although they have four different layers, they whip up super quickly. One reason is I used a brownie mix as the base. If you are a follower of my site you know I’m crazy about brownie mixes – I love the flavor and the ease. But these bars (like most recipes where I use a brownie mix) can also use your favorite homemade brownie recipe for the base. The next two layers are pretty easy – one is just a bag of chocolate chips. Milk chocolate is the best in these, but if you are a big fan of dark use that. OR if you are worried about this dessert being too rich, try using semi-sweet chips. Next is melted caramel. I recommend using the individually wrapped caramels just because the caramel bits (or unwrapped caramel) tends to get pretty waxy. Finally: the “oatmeal cookie” layer which is super quick and easy to make – oats, flour, butter, brown sugar, baking soda, and some salt. Mix together, bake, and dessert is ready! Well, kind of. These bars do take a few hours to really “set-up.” They are pretty gooey right out of the oven so make sure to allow some time for them to harden and the layers to solidify if you want a cleanly cut bar. Happy, happy blogiversary Cat! I wish I could send you all some of these delicious brownie cookie bars to help celebrate! Generously grease (or line with parchment paper) a 9 x 13 pan. Set aside. In a large bowl, prepare the brownies according to package instructions. Bake for 20 minutes at 350 degrees F.
Meanwhile, unwrap the caramels and put in a microwave safe bowl with the heavy cream or milk. Microwave in bursts of 30 seconds stirring for 20-25 seconds in between each burst until the caramel mixture is smooth and creamy. 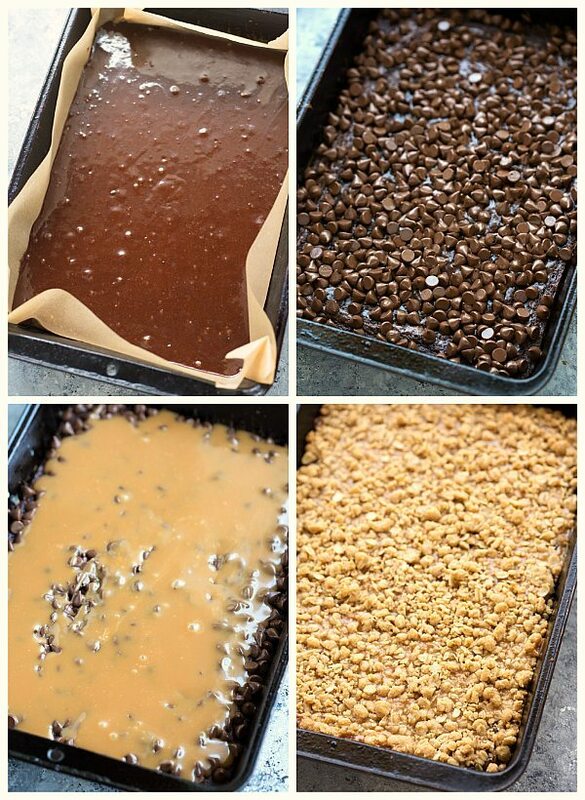 Be patient and microwave for short amounts of time to avoid burning the caramel. When the brownies are done (they shouldn't be cooked all the way - take them out right at 20 minutes), pour the chocolate chips evenly over the brownies. In another bowl, combine the flour, oats, brown sugar, baking soda, and salt. Mix until well combined. Melt the butter and add it to the mixture along with the vanilla. Stir until a good crumble is formed. If the mixture is too wet, add a little bit more flour and if it is too dry, a bit more melted butter. Crumble the cookie mixture evenly over the melted caramel and bake for another 13-16 minutes or until golden brown on top. Remove and allow to cool and set up for at least 1 hour or you are able to cut clean bars. Ahhh girl! I would have cried if I dropped the cake ahhah you are better than I. 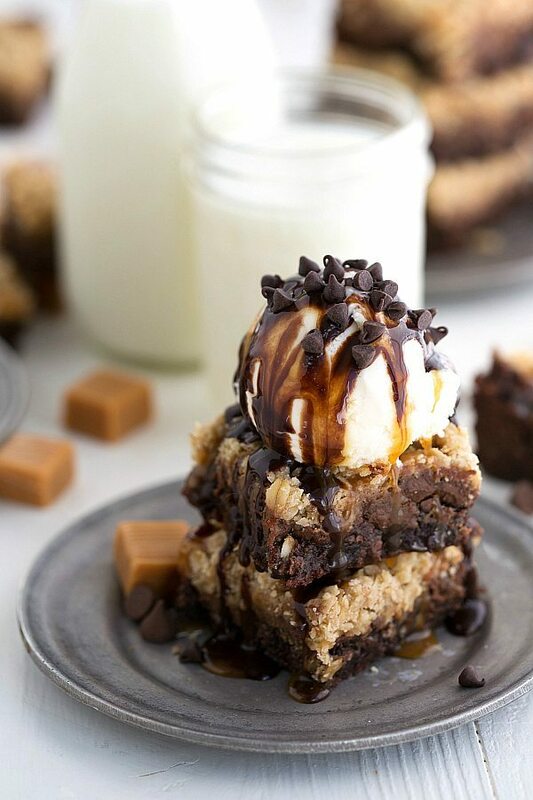 These brownies though… I’m drooling. Oh these bars look amazing, Chelsea! I love the brownie and cookie combo. And everything is better with caramel! Pinned! These look fabulous! I think these would make my Monday so much sweeter. Oh my GOSH. The decadence in this has my mouthwatering and I’m slightly dying because it would have gone so perfectly with my morning cup of black coffee. Feel free to send me a slice or ten ;). And such an awesome giveaway! Entering now! 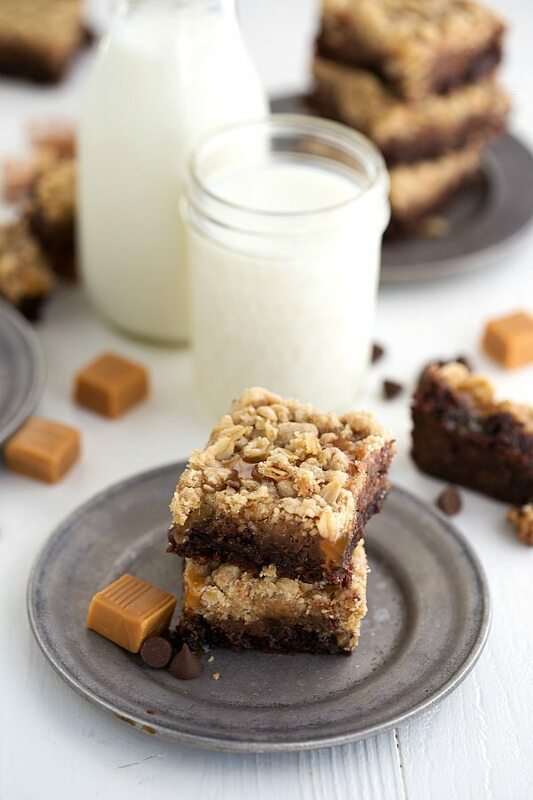 Oh my goodness, these cookie bars look SO amazing, Chelsea! I love all those decadent layers! 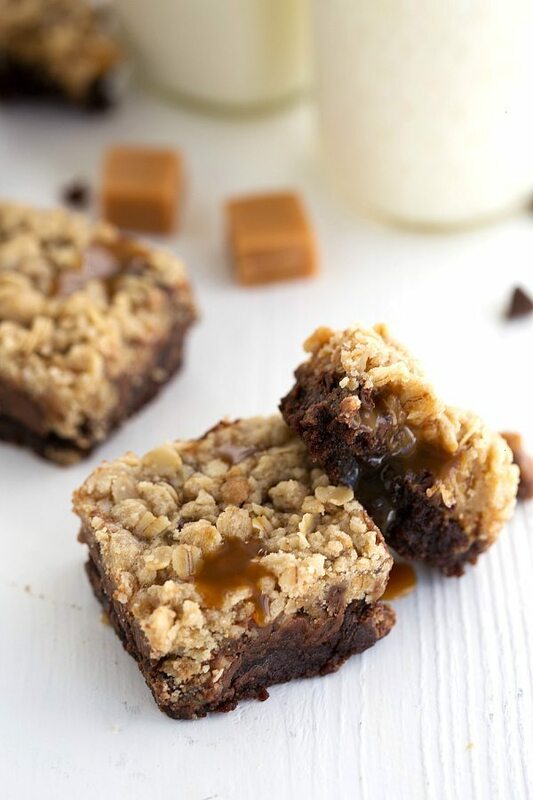 Brownies, caramel, chocolate and the oatmeal cookie sound like the best combination! Such a perfect way to brighten up a Monday! So gorgeous! I think you just combined the best three desserts ever! These look like perfection! Oh gosh! Dropping the cake!! I’ve done things like that and always end up crying haha even though I know it’s so silly! But these bars definitely make up for it! Goodness they look good! These are just as good as any cupcakes! LOVE that caramel layer — wish I could eat them for supper! OMG! These cookie bars………YUM-a-LISH-ous! It doesn’t get better than caramel and chocolate! Oh my lanta…that gooey caramel!! I’m so so sorry about your cake fall, but these bars look absolutely heavenly! 🙂 Pinned! These certainly look amazing! Pinning! These look absolutely delicious! Pinned! Hi Chelsea, I found this delicious recipe on Stumble Upon and had to come see more. It looks so delicious, I have gained a pound drooling over it. I would like to invite you to share your recipe on my Friday Features Linky Party this week. I do hope you will stop over and share. And now I have Pinned and Stumbled! !